We need to export the inbound stock of a product. In fact we use WP all export in order to calculate the right quantities for our suppliers (sales - stock) but results are wrong for products with inbound stock. We'd like to consider the inbound stock quantity in our flow. I don't find any custom field or meta about this inbound stock. Any ideas ? WP all export runs with templates but it can take wp query too. Inbound Stock is saved in a custom table in the database. All the Purchase Orders keep their items in a table called "wp_atum_order_items" (assuming you're using the default db prefix). WP All Export doesn't allow to export data from custom tables, so unfortunately you can't access that data from the plugin. 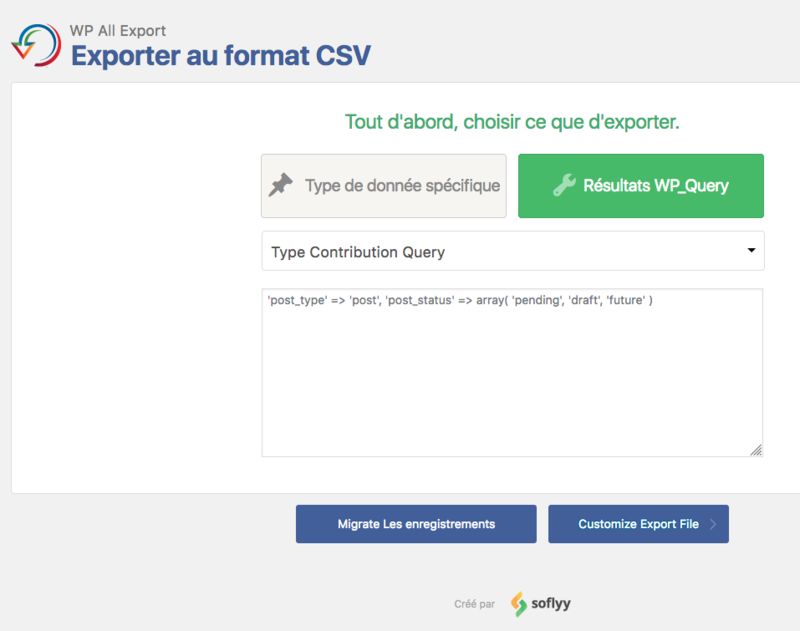 We can make a WP query with WP all export (see picture below). Maybe it's possible this way ? Anyway, can we access to this custom table of yours with another way ? We really need to have access to these datas for setting our purchases with our suppliers. How the others users do ? I understand that this may not be very helpful and that this situation may be stressful for you. We try to accommodate all users needs and export/import is on the table as well. However, we want to have control and not rely on 3rd party software for more than a security reason. Our export/import premium add-on is planned for released in late 2019. Before that, if you have SQL knowledge you can export data directly from the db or use some 3rd party plugin for it. My dev has just pointed one out, but remember this is not our recommendation, just trying to give you some kind of direction. CodeCanyon Plugin.